To find out more about health and wellness products click on the Shop Shaklee menu. Shaklee is the number 1 natural nutrition company in the United States. 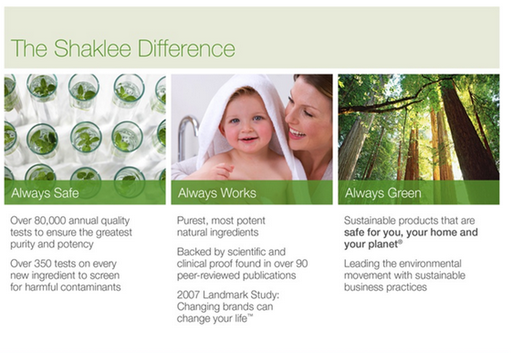 Read below to find out how Shaklee is different. We start with nature. Shaklee scientists search the world over to source the finest natural ingredients. Then we conduct over 350 tests on every single new botanical ingredient for heavy metals, pesticides, or any of hundreds of other harmful contaminants. And we continue to conduct over 80,000quality tests annually to guarantee the purity and safety of each and every product. That’s why we are absolutely sure of this: Every Shaklee product is 100% safe to use. Guaranteed. Plenty of companies claim their products work. But at Shaklee, we have proof. You see it in the over 100 scientific papers, 90 of them published in peer-reviewed journals, that prove the effectiveness of Shaklee products. You see it in the over $250 million invested in clinical testing, research, and development. And you see it in the 2007 Landmark Study conducted in collaboration with researchers from the U.C. Berkeley School of Public Health that showed that people who took Shaklee supplements had markedly better health than those who took a single multivitamin or no supplements at all. And the most enlightening proof of all is in the millions of real people who have lived healthier, more productive lives because of Shaklee. Before any Shaklee product reaches your hand, we’ve done the hard work to make sure it does what we say it does. We lead the environmental movement by example. Dr. Forrest C. Shaklee founded our company on the principle of Living in Harmony with Nature®. That was over half a century ago, and we continue to lead by example. We were the first company in the world to be Climate Neutral™ certified to totally offset our carbon emissions resulting in a net-zero impact on the environment. Our corporate world headquarters is award-winning for its environmental design. My son had bad skin problems, could not eat dairy and wheat, and had bad allergies and asthma. After starting him on Shaklee supplements, and switching to non-toxic cleaners from the Get Clean Line, his skin problems went away, allergies and asthma greatly improved, and can now eat dairy and wheat. Shaklee is awesome! I am loving the Vitalizer. My energy level is high and my workouts at CrossFit have been unreal. After only two days of being on Shaklee supplements, my son is not am not as stuffed up as normal. He can breath much better too. It seems to be working so well I have been giving them to my other kids! Shaklee supplements have made a world of difference in my families life. From us never getting sick when everybody else around us is sick to me not having to rely on my migraine meds anymore, I am ever so grateful I was introduced to this amazing company. I really appreciate knowing that my husband is getting critical vitamins, minerals, probiotics and omegas in his diet through the Men’s Vitalizer strip–especially because I know he doesn’t eat a perfect diet. Nature Bright is awesome with stains! My daughter had cranberry sauce on her clothes. After soaking them in Nature Bright-the stains were completely gone! I used to get so bummed when her clothes got stains all over, now I just tell myself I can soak them in Nature Bright and it will be fine. I also think the dryer sheets are great-they don’t leave any kind of greasy residue on clothes, and prevents static cling, plus, you can recycle them! H2 is amazing-I really enjoy being able to clean things like my baby’s high chair and not worry about toxic chemicals being everywhere. I use H2 spray bottles everywhere-windows, mirrors, fabric, floors, counters, bathroom, and sticky residues like on pots and pans. I can’t stand chemical-like scents, fortunately the Shaklee cleaning products don’t have that. I love, love, love all my cleaning and laundry products. I have very sensitive skin and other airborne allergies and haven’t had any problems using them! I also love the dish and hand soap. We have very hard water and the dish soap goes a long way. I love the yummy smelling scrub also because our water is so hard and it works so well with all the stains in the tub without the toxic powder of comet. The H2 I use everywhere, even in the car and feel so much more at ease because I am not leaving behind any bad chemicals that my precious baby grandchildren can touch or breathe! My favorite moment was washing off are gross moldy garage door and house. It still looks great months later. I used a small amount of H2 in a 5 gallon bucket and must have refilled with water a few dozen times! The suds never went away !!!! Excellent site. Congratulations all the best in your biz.